Botany: Gokṣura is a procumbent annual or perennial herb with many spreading slender branches, the immature portions covered in a fine silky hair. The leaves are oppositely arranged, pinnate, with 3-8 eight simple leaflets that are almost sessile to the leaf stem, with appressed hairs below, and to a lesser extent above. The solitary yellow flowers have five petals, and are borne in the leaf axils, on hairy pedicles up to 2 cm long. The fruits are globose, comprised of five woody cocci that bear two pairs of sharp spines, each cocci containing several seeds. Gokṣura is found throughout Asia, the Middle East, Africa, and southern Europe, in sandy soils, often along roadsides and waste areas (Kirtikar & Basu 1935, Warrier et al 1996). Part used: Fruit and root. Constituents: Researchers have isolated numerous steroidal saponins from Gokṣura, including cistocardin, diosgenin, tribuloin, hecogenin, dioscin, and ruscogenin, as well as several unnamed steroidal constituents. Researchers have also isolated a furostanol diglycoside, the lignanamides tribulusamides A and B, N-trans-feruloyltyramin, terrestriamide, N-trans-coumaroyltyramine, and b-sitosterol (Achenbach et al 1994, Cai et al 2001, Li et al 1998, Sun et al 2002, Xu et al 2001, Xu et al 2000). Kapoor reports an unidentified alkaloid in the fruit in trace amounts (1990). Investigation of the aerial portions of Gokṣura has yielded the furostanol saponin methylprotodioscin and protodioscin and the sodium salt of methylprototribestin and prototribestin, L-mannitol and an inorganic salt, as well as the two b-carboline indoleamines harmane and norharmane. Gokṣura is a rich source of calcium (Bourke et al 1992, Duhan et al 1992, Kostava et al 2002). • Human trials: a clinical trial of 406 cases of coronary heart disease treated with the saponin fraction of Tribulus terrestris resulted in the remission rate of 82.3%, without side-effects (Wang et al 1990). Toxicity: The herbaceous portions of Gokṣura is the cause of geeldikkop in sheep and other small livestock, a condition characterized by edema of the head, fever, and jaundice (Kirtikar & Basu 1935). Two b-carboline indoleamines (harmane and norharmane) isolated from the plant material of Tribulus terrestris have been implicated in causing central nervous system effects in sheep that have grazed on Tribulus over a period of months. Researchers proposed that harmane and norharmane accumulate in tryptamine-associated neurones of the central nervous system and gradually interact irreversibly with a specific neuronal gene DNA sequence (Bourke et al 1992). 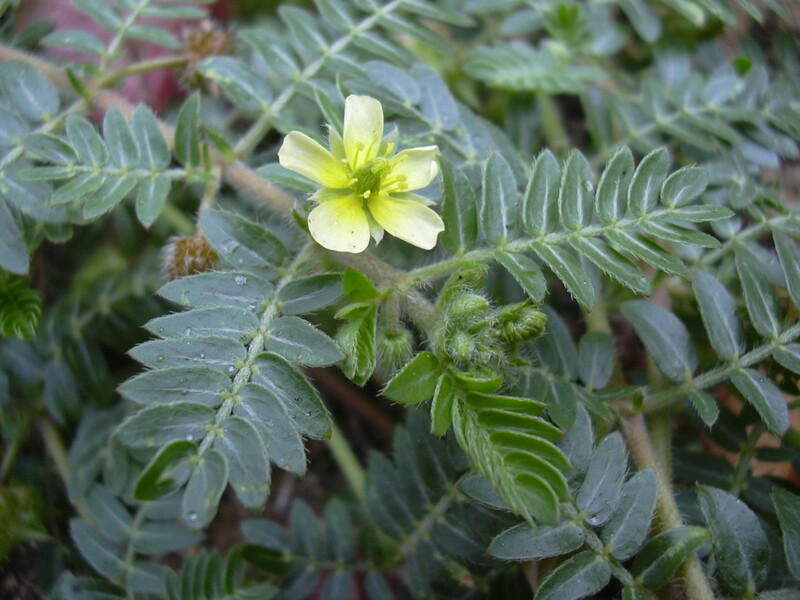 Photosensitization and cholangiohepatopathy have been noted in sheep grazing on Tribulus terrestris (Tapia et al 1994). A recent paper reports gynecomastia in a young male body-builder taking Tribulus as an anabolic agent (Jameel et al 2004). Indications: Hemorrhoids, intestinal parasites, cough, dyspnea, asthma, consumption, hives, dysuria, hematuria, urinary lithiasis, cystitis, nephritis, urinary tenesmus, spermatorrhea, impotence, frigidity, infertility, venereal diseases, cardiovascular disease, gout, rheumatism, lumbago, sciatica, menorrhagia, postpartum hemorrhage, anemia, diabetes, opthalmia, headache, insufficient lactation. Contraindications: Dehydration (Frawley & Lad 1986); pregnancy (Bensky and Gamble 1993). Medicinal uses: Gokṣura is an outstanding remedy in urogenital disease, promoting urine flow, soothing the mucosa, and aiding in the excretion of stones and calculi (Frawley & Lad 1986). Unlike diuretics such as Bearberry leaf (Artostaphylos uva ursi), Gokṣura pacifies vāta and will not promote secondary effects such as dry skin. Nadkarni mentions that both the plant and seeds are used in decoction or infusion in the treatment of spermatorrhea, impotence, infertility phosphaturia, dysuria, gonorrhea, gleet, chronic cystitis, renal calculi, incontinence, gout, and post-partum hemorrhage (1954). In most cases of cystitis a simple decoction of the fruit or the tincture will suffice, although in severe cystitis botanicals such as Marshmallow root (Althaea officinalis) or Corn Silk (Zea mays) can be used in combination for additional demulcent properties. In severe tenesmus and pain it may be used along with Kava root (Piper methysticum) or Henbane (Hyocyamus niger). For urinary lithiasis Gokṣura may be combined with Buchu herb (Barosma betulina herb) and Gravel root (Eupatorium purpurea). For urinary incontinence and bedwetting a combination of Gokṣura and Mullein (Verbascum thapsus root) may be helpful to strengthen the trigone muscle of the bladder. Gokṣura is highly esteemed as a vajīkaraṇa rasāyana. In the treatment spermatorrhea and impotence equal parts powders of Gokṣura, Tila, Kapikacchū and Aśvagandhā may be taken with honey, ghṛta and goat’s milk, 12 g b.i.d. on an empty stomach at dawn and at dusk. For frigidity and infertility Gokṣura may be taken in equal parts Śatāvarī root and Damiana, 5-10 g t.i.d. Frawley & Lad consider Gokṣura to be a rasāyana for pitta, and state that it is effective in vātakopa conditions (1986), the harmine alkaloids most likely contribute to Gokṣura’s sedative properties. It may be taken with Aśvagandhā as a tonic nervine in vāttika disorders such as nervousness and anxiety. For lumbar pain Gokṣura may be combined with Śūṇṭhī, Kava (Piper methysticum) and Wild Yam (Dioscorea villosa). Warrier et al mention that the ash of the whole plant is good for external application in rheumatoid arthrtis (1996). Topically, the oil of the seed is used in the treatment of alopecia (Frawley & Lad 1986). In Chinese medicine Gokṣura is used in the treatment of headache, vertigo and dizziness due to ascendant liver yang and wind-heat (Bensky and Gamble 1993). As a vajīkaraṇa, the Bhāvaprakāśa recommends Gokṣurādi modaka, comprised of equal parts powders of Gokṣura, Ikṣura bīja, Aśvagandhā, Śatāvarī, Musalī, Kapikacchū, Yaṣṭimadhu, Nāgabalā and Balā. These powders are mixed togther and fried in an equal volume of ghṛta, eight parts milk and two parts sugar until most of the liquid is evaporated, after which the extract is then rolled in pills, taken in dosages according the strength and needs of the individual (Srikanthamurthy 2000). In the treatment of diabetes and urinary tract disorders the Śāraṅgadhara saṃhitā recommends Gokṣurādi guggulu, prepared by boiling four parts of Gokṣura in six times the amount of water until the original volume of water is reduced by half. The decoction is then strained from the herb, and one part Guggulu resin is added and mixed in with the decoction, to which is added one part each the powders of Triphalā, Trikaṭu and Mustaka. The Śāraṅgadhara also states that Gokṣurādi guggulu is useful in menorrhagia, gout, diseases of the nervous system, and infertility (Srikanthamurthy 1984). • Cūrṇa: 3-6 g b.i.d.-t.i.d. • Kvātha: 30-90 mL b.i.d.-t.i.d. • Tincture: dried fruit, 1:3, 50%; 3-5 mL b.i.d.-t.i.d.